Hey everyone! I have done it! I have hit 2000 LinkedIn followers! 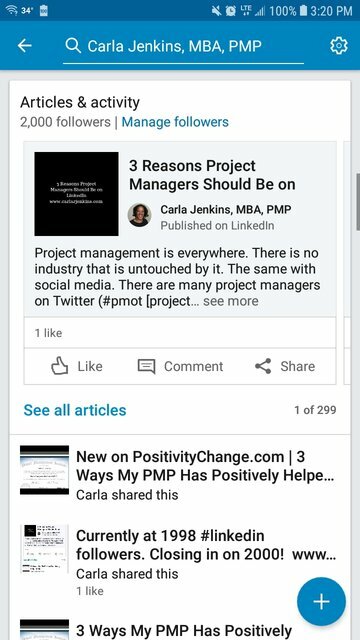 As a business blogger, this is a huge accomplishment because I have been steadily dedicated myself towards engaging with my community and helping others in the project management space. I have learned so much from my followers and am very grateful for them. When I started that writing on LinkedIn Pulse back in the summer 2015, I promised myself that I would never write any fluff. I felt that I was rewarded with 2000 followers by adhering to this mantra.